The other day on tv, there was a chinese restaurant that shared their char siu recipe. I'm always interested in finding new recipes that taste like "home". 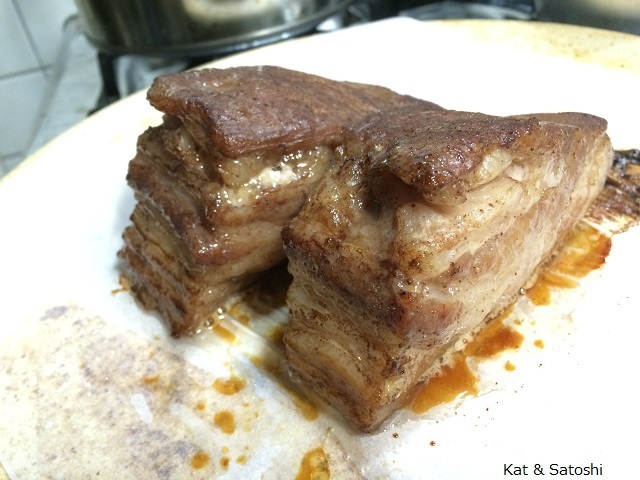 This char siu recipe comes really close. Put everything in a ziploc bag and marinate overnight. Bake at 180C (350F) for 15 minutes. Flip and bake for another 15 minutes. NOTES: The original recipe doesn't say to put everything into a ziploc bag, but it was the easiest way to marinate something and massage/flip it every time I opened the refrig. After baking it for 30 minutes, the clear pork fat that was in the oven was actually glisteningly beautiful! I let the meat rest for 5 minutes and I sliced it. It wasn't cooked, so I sliced everything and put it back into the oven for another 5 minutes. 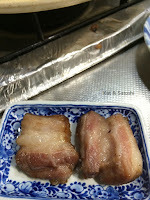 Tastewise, it is close to the Cantonese style char siu that I grew up with. I like that it doesn't use all that red food coloring that we see in Hawaii. I'm freezing most of this and will use it in fried rice. I'm making this again. Saturday the weather was beautiful and HOT! 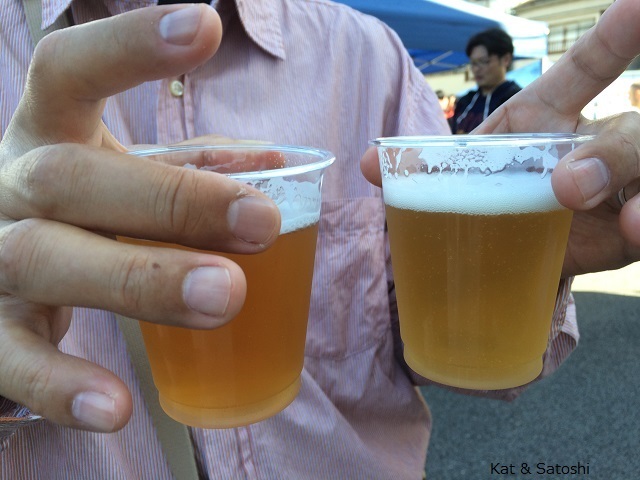 Satoshi had a morning chat session with people from his German class, so afterwards we met up to check out the World Craft Beer Tasting. 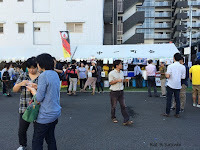 They had many beers from the US, Scotland, Germany, Belgium, as well as some from around Japan. 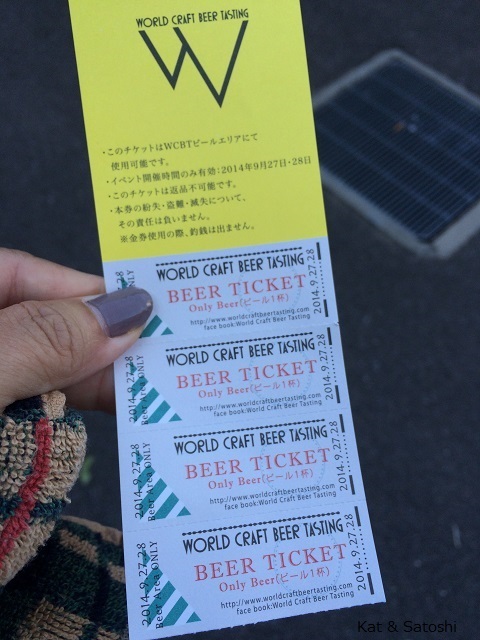 If we had bought our drink tickets earlier for 3000 yen we could've gotten 6 drinks for 500 yen each. Instead we paid 2800 yen and got 5 drinks for 560 yen each. 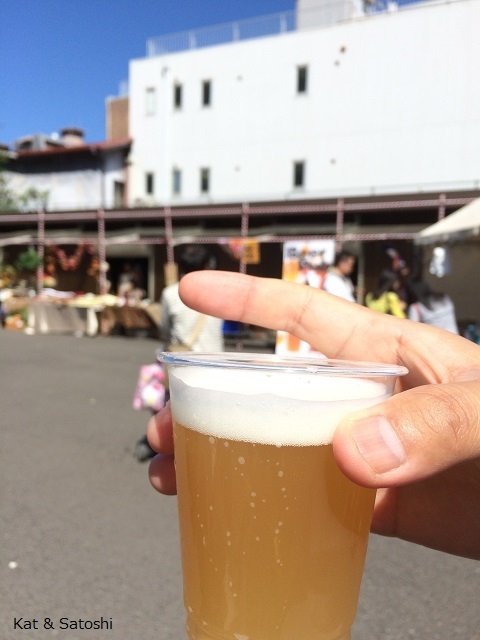 Satoshi and I shared the first beer...Minoh's Peach Weizen. This beer was really fruity and peachy! Apparently, this peach weizen was a limited edition beer, so I am glad we got to try it! 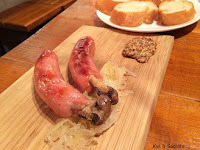 We shared this pork sausage by Taverna Entrata...600 yen. 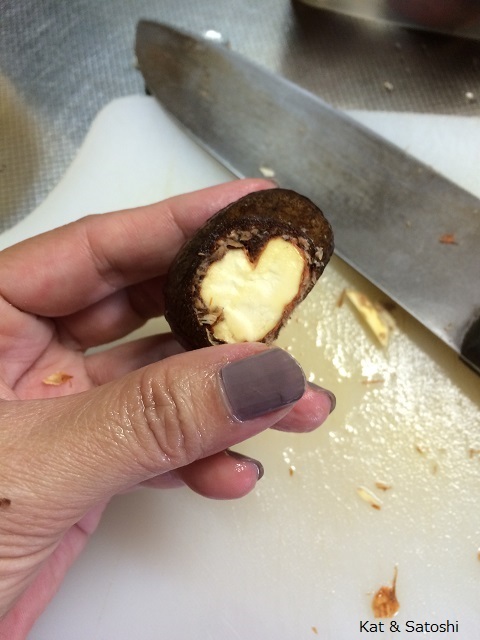 Super hard to eat without getting messy, but I loved the snap of this. Just like a carnival, you use scrips to purchase your beers...one beer per ticket. Food items had to be paid with cash. Next I tried Fifty Fifty's Darkslide IPA, this was more like a Porter or Stout...love! 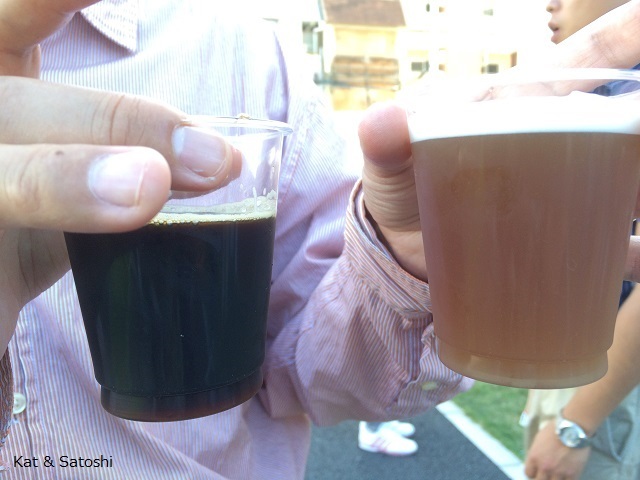 Satoshi tried Crew Republic's Munich Summer beer. We shared this plate of smoked sanma (saury) and roast pork by Aggi. We weren't sure why they served this with a dollop of wasabi. 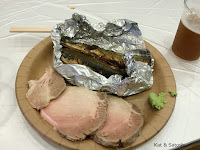 The seasonings without the wasabi were simple and the smokiness made these dishes perfectly match the different beers. 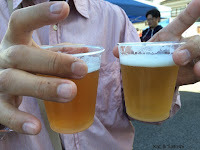 Satoshi then tried Van Eecke's Extra Dry Hopped Hommelbier 2014 while I tried Pizza Port's Ponto Session IPA. I hadn't read the signs properly and thought I was ordering a port, so I was surprised when the server handed me a light colored IPA. 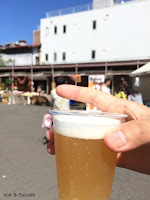 This beer was nice and fruity and it was served really cold which hit the spot since it was so hot out. It doesn't look like a lot of people at this event, but there were and I was surprised at the amount of foreigners that were there. This was our first time going to an event like this and we had fun. I hope we can check out other craft beer events in the future. Today our blog turns 9. As most of you know I started this blog as a way for my friends and family to keep up with us without filling up their email inboxes. We don't have the most hits or the most readership like other blogs do, but that's just fine. 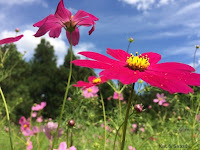 I am grateful and appreciative for the connections and the friendships that blogging has brought our way. I bought a bag of chestnuts at the market...about 450 grams, for 498 yen plus tax. 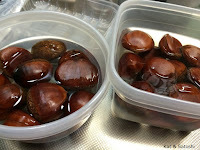 I read somewhere that you should soak your chestnuts overnight so that they are easier to peel...so that is what I did. With your knife, carefully peel the fuzzy skin and the skin closest to the chestnut. 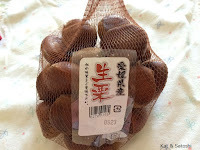 It is very difficult to just peel off the skins, so just be prepared to lose some of the chestnut flesh while peeling. When you are done peeling, soak the chestnuts in water, this helps get out the aku (bitter taste). 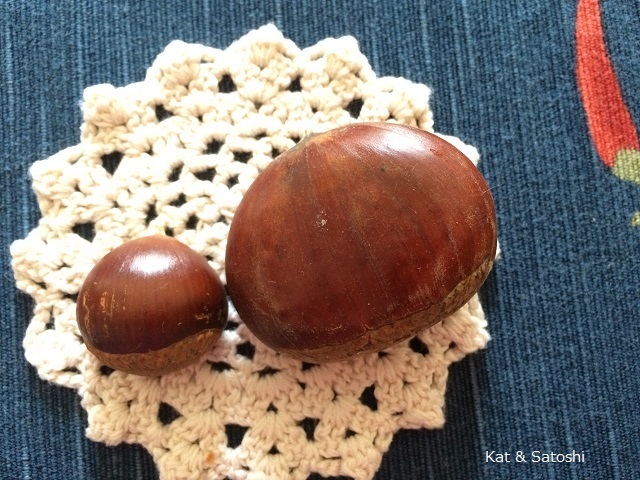 I ended up with 350 grams or so of chestnuts. Wash 1.5 cups of white rice and 1/2 cup of mochi rice. 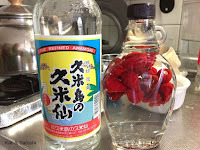 Add 2 cups of water, 1 teaspoon of salt and 1 teaspoon of sake (rice wine), mix well. Turn your rice cooker on and let it do its job. NOTES: this turned out better than the Yaki Kuri Gohan I made back in 2006 and way better than the one I made back in 2012. Even though I still managed to poke the softest part under my thumbnail while peeling the hard shell...ow! This was worth it. I am always influenced by what I see on tv, especially when it comes to food. Satoshi and I watch a show called "Sarameshi" which is short for "salarymen (businessmen) meshi (food)". Anyway, the show airs at 11-ish at night and boy, do they make us hungry! On a recent episode they featured this...shoyu butter corn yakionigiri. Corn cooked in shoyu and butter is a well-known winner in Japan, but to add it to rice...brilliant! We had to try this. After cleaning your corn, remove the kernels carefully from the cob with a knife. 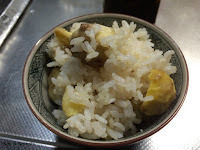 Then add the corn kernels and cob to the rice and cook. 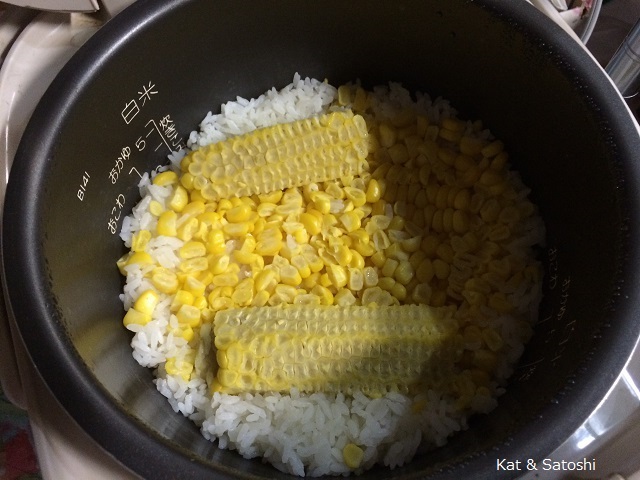 All the corn "goodness" will come out from the cob and flavor the rice. Remove the cob from the pot and mix the rice. Then take some butter and some shoyu and fry. Flip once or twice carefully with a spatula. You'll get some burnt areas, but that's the best parts! No real recipe for this...I used 2 cups of rice and 2 cups of water. 1 corn on the cob. A nub of butter and 1 teaspoon of shoyu. NOTES: The fresh corn is cooked perfectly with the rice and is still quite crisp after it cooks. 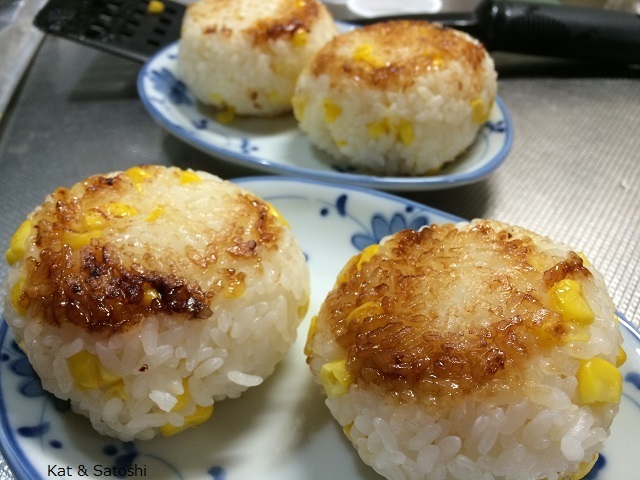 The sweetness from the corn matches perfectly with the saltiness of the butter and shoyu. I'll have to make this again next summer when corn is in season. Recently in "ELLE à table", there was a story about different hot sauces of the world. 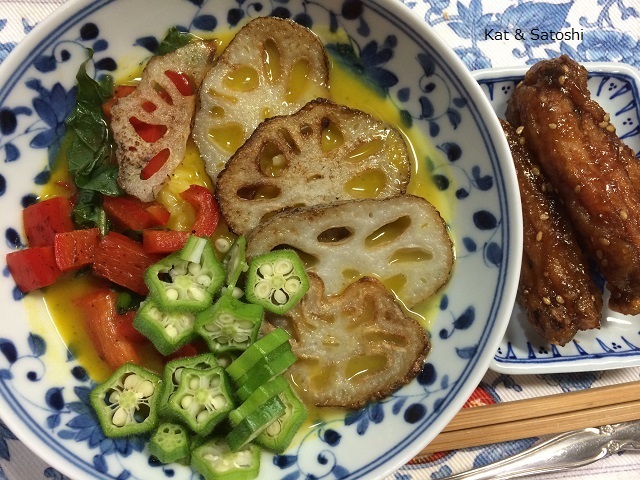 One that was featured was koregusu, the Okinawan hot sauce. They also had a recipe using it with tako (octopus), so I gave it a try using my homemade koregusu. 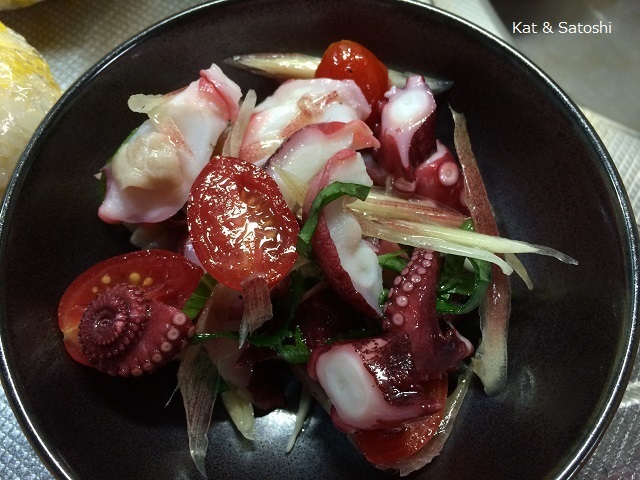 Take the tako and cut it into bite sized pieces. Add the koregusu, amount is up to you. Just before serving add the myoga, shiso, cherry tomato. NOTES: If you cannot get myoga, substitute with red onion. 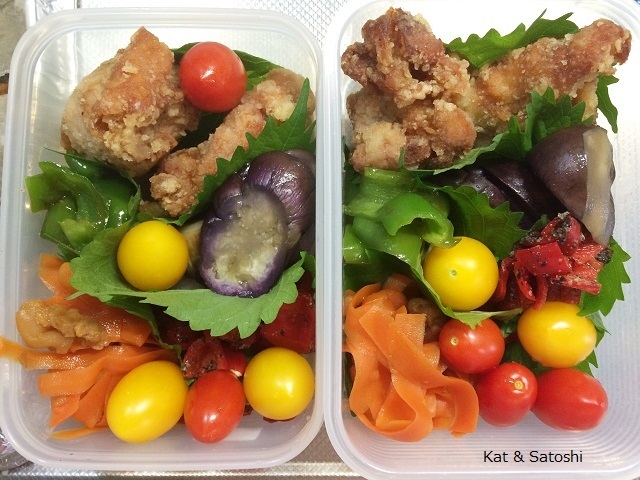 Shiso can be subbed with basil. Lime juice can be subbed with lemon or another citrus. You can also add sliced cucumber and okra too. When I first put the oil, koregusu (1 teaspoon) and lime juice together, it wasn't hot...so I added 2 more teaspoons of the hot sauce. When we ate the tako there was a slight "burn" but nothing "fiery". I would also add some shoyu for more flavor. I am making this again. Sunday was a beautiful day, so we decided we should get out and about. 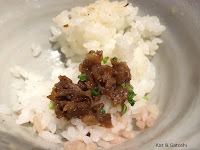 I was amazed to find out from my archives that the last time we had been to Cosmos no Sato was 6 years ago. 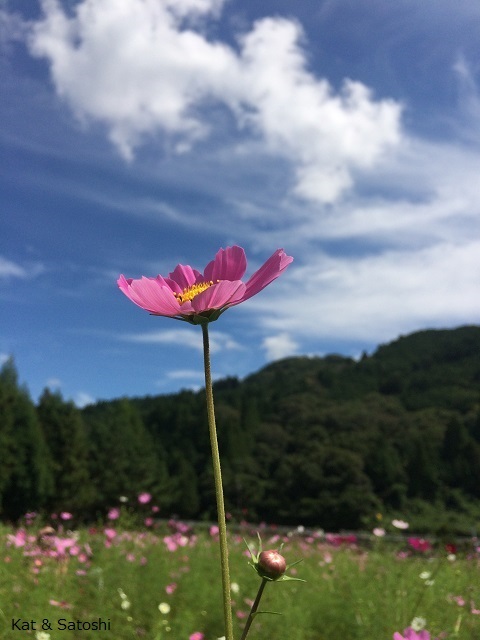 We had a holiday yesterday, Autumn Equinox. Weird that the holiday fell on a Tuesday. Oh well, can't complain, short week. Saturday, we met up with Satoshi's friend and his son to go to the Maya Rucksack Market. 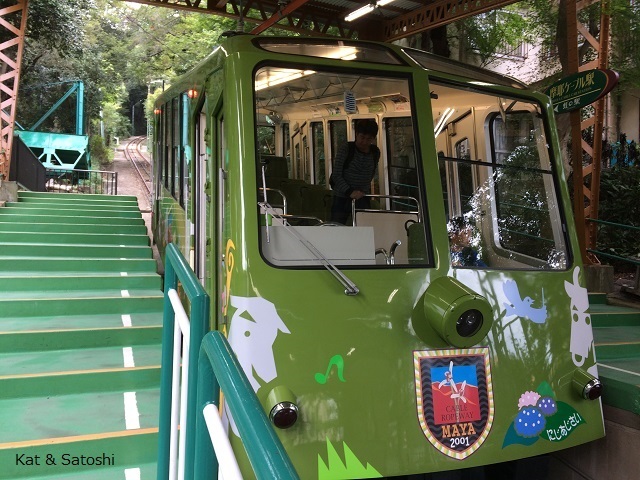 Maya is the name of a mountain in Kobe. Rucksack is a European word for backpack. This market is actually a flea market. To get to the market, we needed to take the Maya Cable up. When we got there closer to 11:30 (the market starts at 11:00), many vendors were scattered along the walkway to the Maya Ropeway. 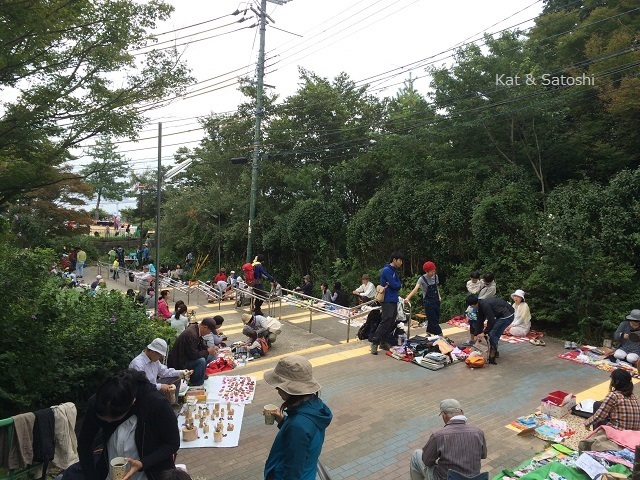 There is also a tiny park where some vendors had set up, there were also many families picnic-ing. There is no fee for sellers. If you want to sell food though, you need to apply in advance listing what you will sell and what ingredients you are using. Apparently this market is held several times during the year. Since we didn't know what types of vendors would be there, I packed a bento for our lunch. 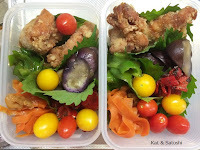 Karaage (fried chicken), eggplant with shoyu & vinegar, red bell pepper with black sesame, green bell pepper with oyster sauce and carrots simmered in dashi (stock) and ume. I also made some musubi (shiso and konbu). 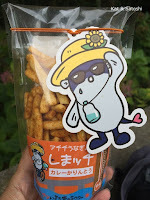 For dessert, I also shared some energy bars with his friend...so good! lots of goodies in it, Thanks again Jalna! 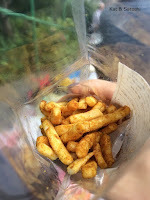 One thing that I bought while at the market was this karinto (fried dough). I've tried savory karinto before and this one was curry flavored. Shimacchi curry karinto, made by a group from Kochi prefecture in Shikoku. They had 3 types, mild, medium and hot. 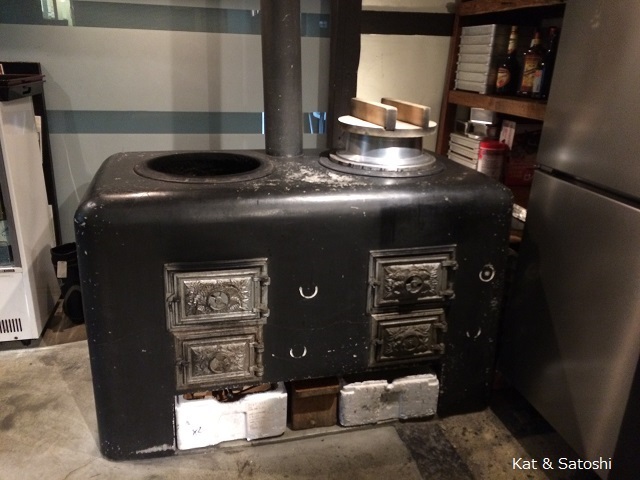 Gosh, this thing was hot, we were all coughing while eating it, and then we got kinda used to it and couldn't stop. 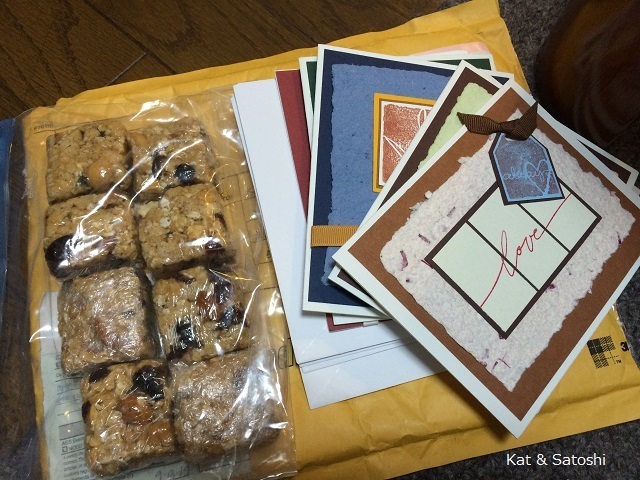 Thank you to blog friend, Jalna, for brightening my day with a care package the other day. Some of her homemade note cards and energy bars. I shared these energy bars with some friends that we met up on Saturday. Will write more about that outing soon! I really appreciate your thoughtfulness Jalna! What do you have growing on your lanai/garden? 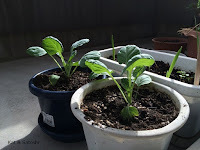 I also picked up these two brussels sprout plants. At 55 yen each, they were a bargain. As for flowers, I planted ranunculus. And it looks like the freesia is coming up in the pots too. I covered several planters with plastic since it has been a bit nippy in the mornings and evenings. 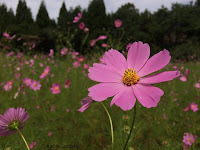 I hope your garden is doing well, have a nice week. Well, I used most of them to make "koregusu" (co-ray-goo-sue) an Okinawan hot sauce. Just take some chilies, cut off the stem and put them into a glass jar. Then fill it with some awamori, Okinawan liquor. I'll let you know when we start using this. I recently came across some blueberries grown in Nara prefecture. 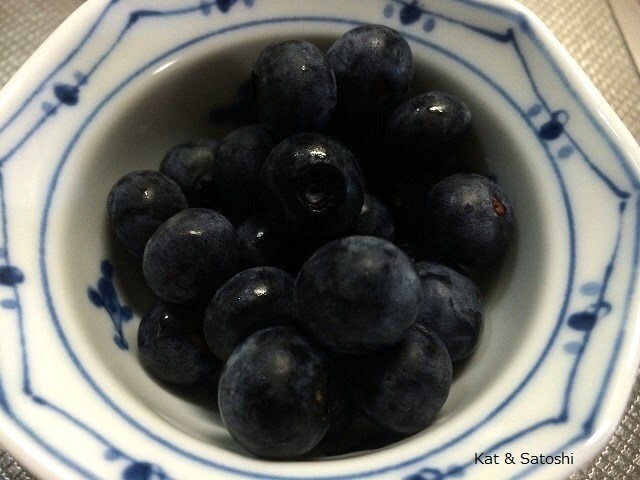 The berries weren't too big but these were a little tart and a little sweet. 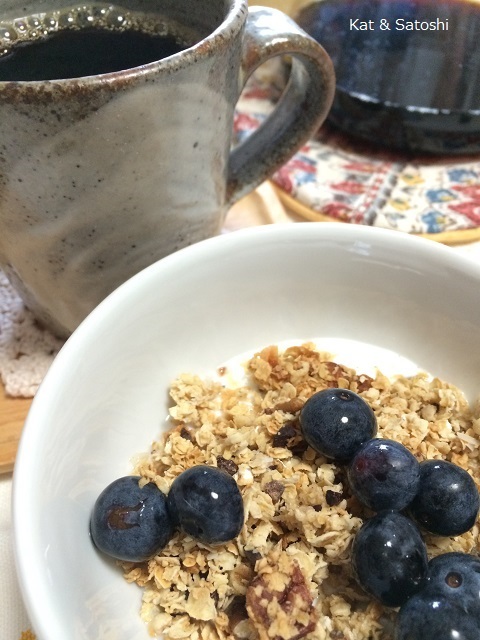 Good with yogurt and homemade granola. It's Friday here, I hope you have a nice weekend! 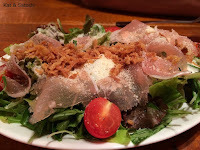 Most of the items on their menu starts from 500 yen. They don't have a large beer selection, mostly cocktails. Meals start off with their tsukidashi (amuse bouche) which on this day was a sliced duck and thinly sliced onion with a vinaigrette...648 for two servings. We ordered their caesar salad, this comes with a poached egg on top...626 yen. 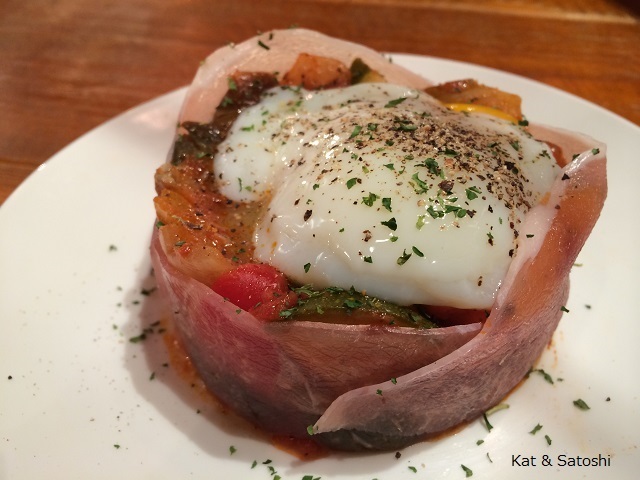 Ratatouille, this also comes with a poached egg...626 yen. Shrimp and button mushroom ajillo. 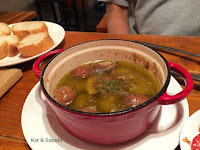 Shrimp and button mushrooms come out boiling in this garlic olive oil "soup"...842 yen. They serve it with 4 slices of baguette...up the bread slices please! Sausages with the bone in. 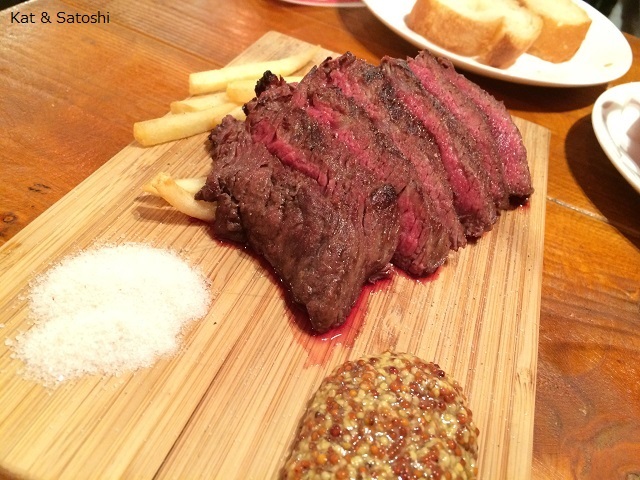 Steak...um, you need to rest the steak before cutting and also, maybe not serve it so rare. Turned all the fries underneath an unappetizing red. 150 grams for 1620 yen. With drinks, our total was 6554 yen (tax included). Not bad with drinks, but the steak really turned me off. Would I go back here? Probably not. Still, I'm glad we tried them. Last week, I had wanted to use up all the veggies in my fridge. 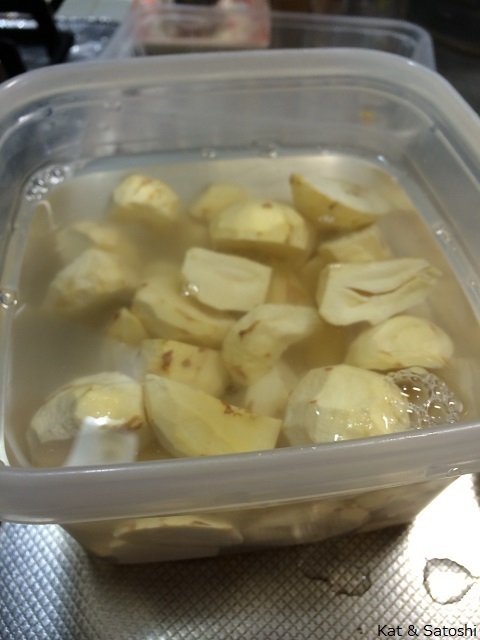 I sauteed some onions until they were transparent, and then added 2 cups of water. Then I added some pumpkin and when the pumpkin was cooked, I added some chicken broth. I then whizzed the soup with my hand held blender until there were no lumps. Envisioning fried renkon (lotus root) chips, I fried thinly sliced pieces. Unfortunately, I drained them on a paper towel and they kind of steamed, so they weren't too crispy. After setting aside the renkon, I sauteed some kale from the lanai with some red bell pepper in some olive oil. I ladled a bowl of the pumpkin soup and then topped it with the renkon, kale, red bell and then sliced some okra. It definitely isn't soup weather here yet, but I'm glad I was able to use up the veggies in my fridge and the kale from the lanai. I'm also sending this soup to Deb for her Souper Sunday. It's been awhile since I've sent her a soup. If you've never checked out her round-up, please do, there are always creative and delicious creations there. 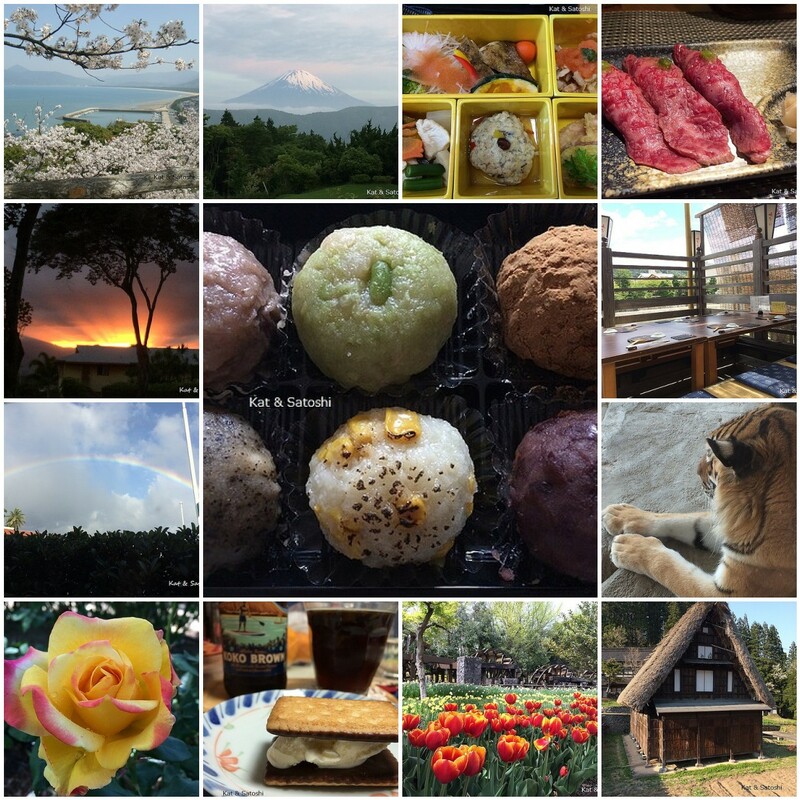 Sunday, we woke up early because we wanted to head out to Hikone. It had been several years since we had been there and even more since we paid our respects to MIL's family graves. We stopped at Umeda to buy tickets for JR. When Satoshi walked up to the counter he asked the guy if they had any discount tickets, the guy replied no...then he checked a manual and voila! 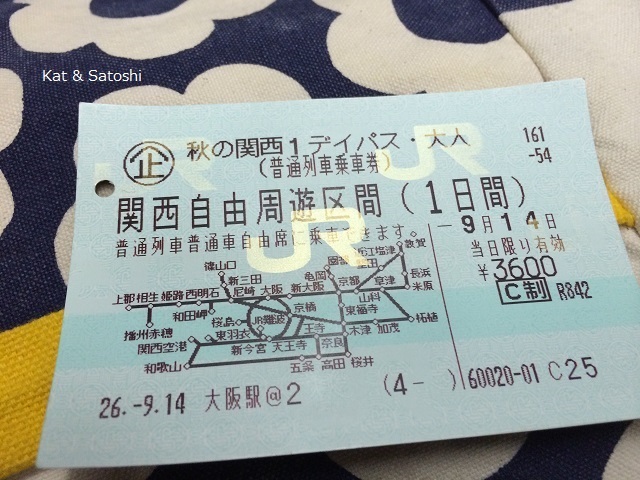 An all day pass to travel anywhere listed on the ticket in Kansai. 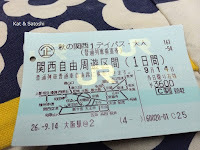 One way to Hikone would be 1940 yen, for this ticket 3600 yen, it would be a little less than a round-trip ticket (3880 yen)...Satoshi felt like he hit the jackpot with this. 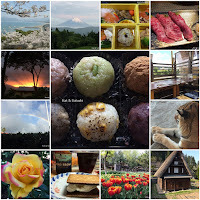 As we rode JR to Hikone, Satoshi looked at different travel guides and decided that he wanted to check out some places on the JR line. Since this ticket allowed us to get off and on the train this was perfect. Usually in Japan, when you buy a ticket they only allow you to get off at the specified destination. 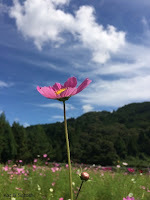 When we arrived at Hikone, we bought some flowers for MIL's family graves. 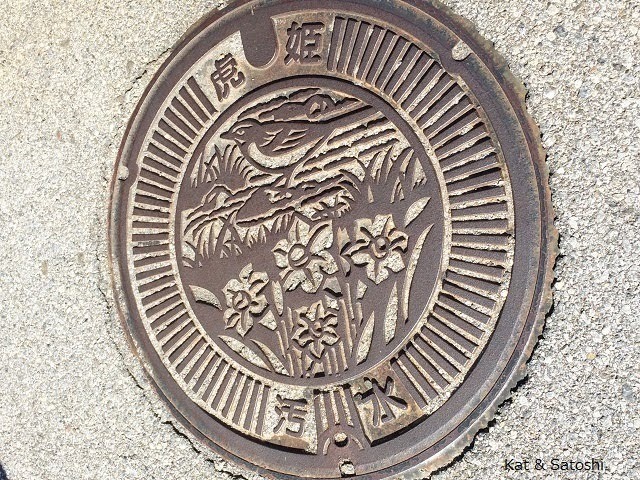 And then we made the trek to Soanji, which is located on the Yume-Kyobashi Castle Road. Over the years I think this road has become a bit more touristy. But, I like the way they make all the buildings look like you are in an Edo time period. After calling MIL to reconfirm the exact location of the graves, we said a few prayers and then decided to look for something for lunch. 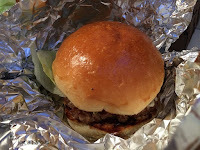 We stopped into Lu Pan, a tiny burger shop serving Omi Beef Burgers. 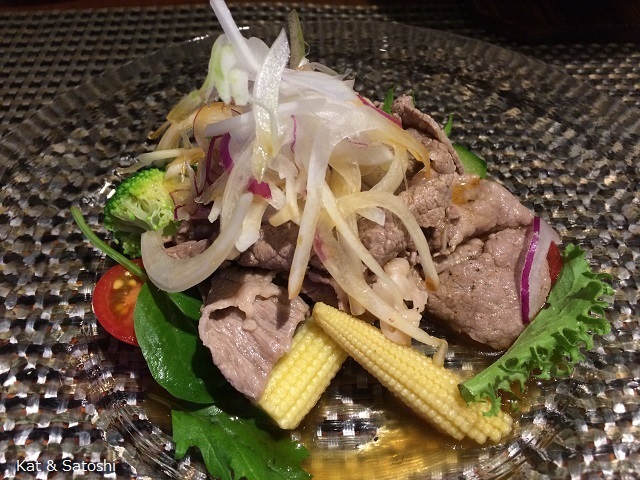 Omi Beef is the brand beef of the area. I ordered their standard which is shoyu based. Satoshi went with their burger with curry sauce. We also shared a half order of their fries and shared a coke. Total 1560 yen tax included. 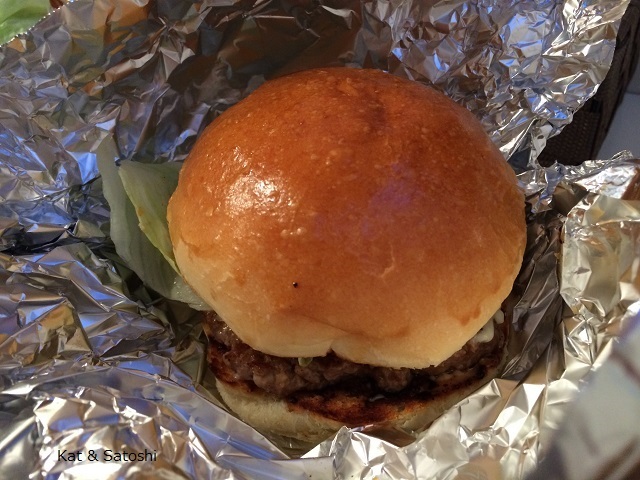 The burgers were very moist and the buns very airy. Even though the guy running this place had absolutely no personality, the food was delicious. Then we were off to Yogo. When I asked Satoshi what was there, he said, "a lake". 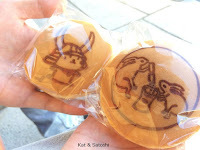 Before hopping on the train though, we got some dorayaki from Kotetsu. Sweet bean paste for Satoshi and walnut sweet bean paste for me. A nice snack and a nice place to rest our feet. From Hikone it was 9 stations to Yogo. When you get off the train, you'll know that the only thing to see here is "the lake". There are no shops near the train station, just a walk to "the lake". It was beautiful to see Lake Yogo. Since there weren't many trains running, we hopped back on the next train and headed to Torahime. This is where Satoshi's grandma used to live. He was in awe at how small the river (stream) he used to play in was and how close the walk was from the train station to his grandma's house was. 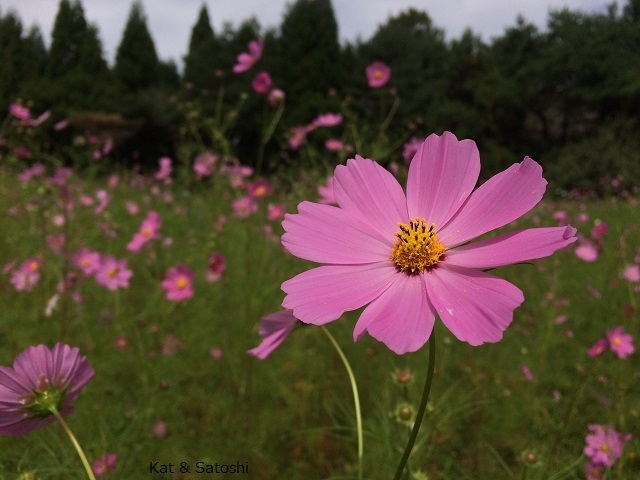 Apparently the house that Satoshi's grandma used to live in is no longer there, but it was nice for him to re-connect with the area. Since we had some time before the next train, we popped into a new bakery that is in the JR Torahime station and bought some snacks. 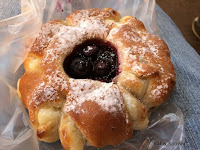 I had this blueberry cream cheese walnut bread, super soft. Just the right amount of sweet from the blueberry preserves, a little tartness from the cream cheese and some crunch from the walnuts. A nice thing about this bakery is that everything was 108 yen! A bargain if you've ever been to bakeries in Japan. 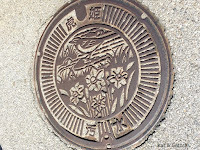 Then it took us some time from Torahime to get to Omi Hachiman, so by the time we arrived in Omi Hachiman it was 17:30. The place we had wanted to have dinner at was fully booked so we jumped on the train and went to Yasu (2 stations over from Omi Hachiman). Kurogama is a restaurant in a 100 year old house. Satoshi and I both ordered the luxurious Omi beef course. He had 5 different cuts while I had 3 different cuts of beef. Dinner started out with this beef shabu salad. The dressing was citrusy and really brightened the flavors. The meat was thinly sliced and super tender. 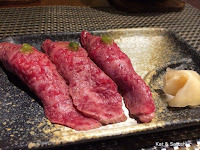 Next came the slightly seared beef sushi...talk about melt in your mouth! Here are the 3 cuts that I ordered, sorry I can't remember what the waiter said they were! To cook them they heat up a ceramic disk and you add a little nub of butter. 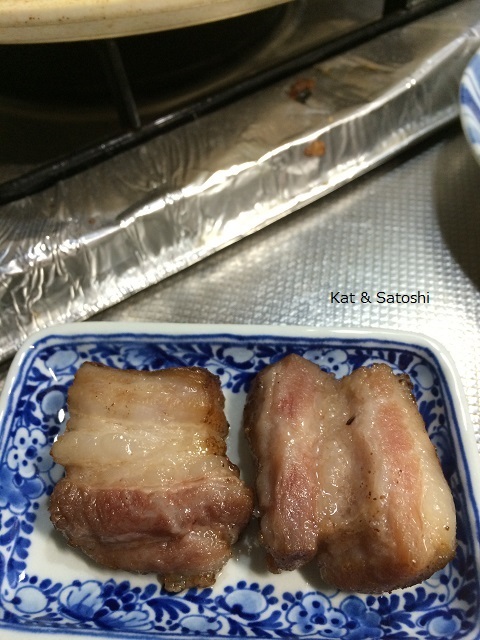 You can cook it as rare or as well done as you wish. Rice is cooked on a very old stove and is served with pickles and their shigure-ni. I've made shigure-ni in the past. And we both agreed they didn't need to serve the pickles, just the shigure-ni with the rice was perfect! 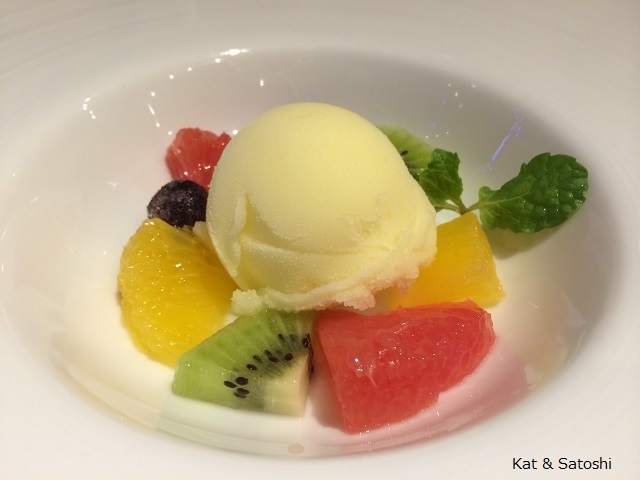 To end the meal they served us some yuzu (citron) sherbet with fruits. I loved that there were bits of yuzu in this! What a wonderful meal! 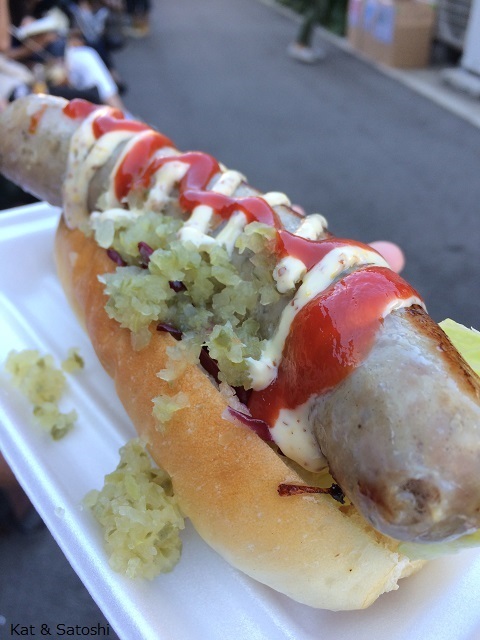 we raved on and on about how soft the meat was. 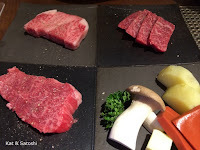 At 5800 yen and 7000 yen plus tax, it wasn't a cheap meal, but we agreed it was worth every penny! A very long day, but we got to do so much. 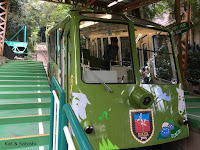 We were really happy with that train pass because it allowed us to see more than we would've had we got just the regular fare. Hope you enjoyed this adventure too!